We finally found a new saxophone for MK! 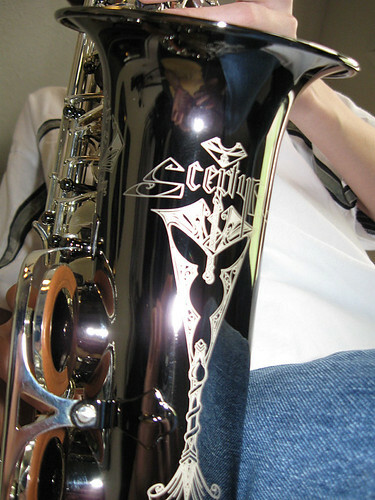 It’s a beautiful black and silver Cannonball Intermediate sax and we got the best deal on it! We’re very pleased. We shopped around. We went to a different music store and sampled their inventory. MK really liked a gold Yamaha pro sax and though the price was a bit high, it was still lower than we had priced them at other times. He loved the saxophone and really wanted to buy it. 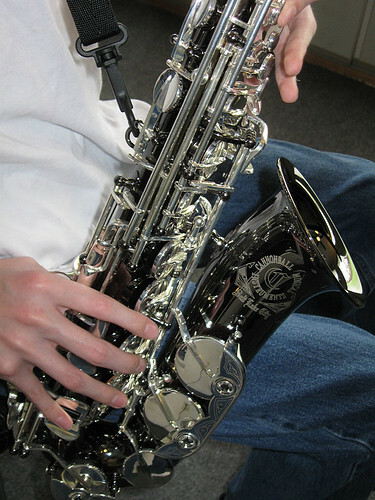 But we talked him into visiting the music store we had rented his beginning sax from to see what they had in stock. And we’re so glad we did! When MK played the black Cannonball, I could tell, right away, it was a perfect fit. He just handled it like a pro and all of the notes were so rich and full … there was no need to shop around anymore. 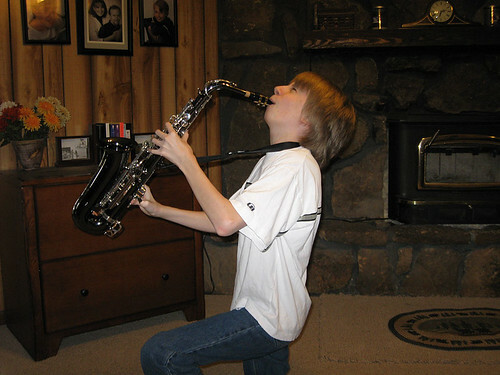 Because we were long-time customers of that music store, we were able to cash in the equity in the sax we had been renting from them for the past three years and apply it to the Cannonball – let’s just say, it was LESS than half of what we would have paid for the Yamaha! AND, we had such a low balance left on the rental, that we went ahead and paid that off, so now he can play his old rental in marching band and save the Cannonball for concerts and competitions next year. MK spent most of the day playing his new sax. When he wasn’t playing with it, he sat with the case, and when that got old, he opened it up and polished up the silver parts. He absolutely loves it. He can NOT wait to show the rest of his band members when he goes back to school on Monday. 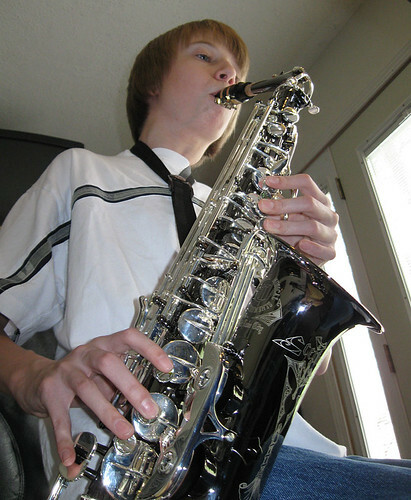 He says he feels very special now and he will definitely stand out from the rest of the saxophone players. Considering he’s first chair, he really likes the idea. I’m hoping this enthusiasm carries into the summer and he practices hard for his audition into the high school jazz band next fall. This purchase couldn’t have come at a better time because today, is MK’s 14th birthday! HAPPY BIRTHDAY, SON!! We’re so proud of you and your musical talent! Every last Saturday of the month, I host a blog carnival of your best blog articles. Submit the link to that one blog post that really says something about you and your life. Welcome to the FOURTH In My Opinion!! Did you answer the questions? I hope so! 1. What would you like to change about your relationship with your family? 2. Which of your teachers has had the greatest impact on you? 1. Should the individual or society be of primary importance? 2. What’s the most beautiful place you’ve ever seen? 3. If you could spend tomorrow doing anything you desired, what would you do? Need to know about this video meme? Check this entry out. 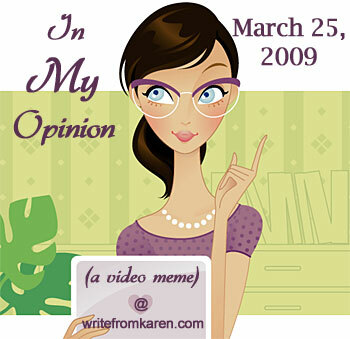 By the by, I changed my username on Twitter, you can now find me @writefromkaren. I made an account before I realized that I could simply change my username on my existing account – yes, I’m a dweeb. If you follow me, I’ll follow you! Please follow me? I’m lonely over there.